This frame is made of top quality steel and deformed aluminum alloy and treated with galvanizing, oxidation andelectrostatic plastic spraying. The frame has solid structure and pleasing appearance. Fully-closed structure with the advantages of good performance of dust-proof, pleasing and neat appearance. 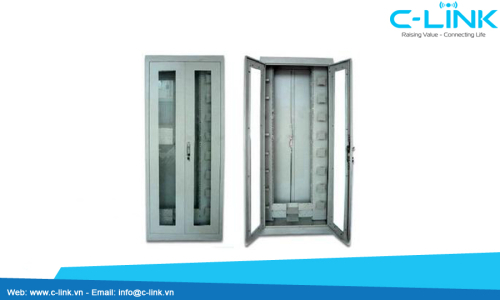 Enough space for fiber distribution and storage space and very easy for installation and operations. Fully front side operation, convenient for maintenances. Minimum bend radius is controlled of 40mm. The optional cable inlet system is installed on the top of the frame which has excellent performances for fixing theincoming cables. Cables can be entered to the frame either from the top or the bottom of the frame subject to different requirements. This frame is suitable for both bundle (loose) cables and ribbon type cables. Reliable cable fixture cover and earth protection device provided. Easy for management and operation. Splice protector tube, Sticky cincture, Sticky cincture, Cables ties, Hose clamp, Sealing washer, Plugs, Tapecollar gauge, Marking note, Hanging hook, Allen wrench, Insulate robber belt.